In 1896, Utah became the 45th state to join the United States, and Salt Lake City was named its capital. The Great Salt Lake, after which the capital is named, is the largest saltwater lake in the western hemisphere. The state itself was named after the Ute people, and Utah remains home to five distinct Native American Tribes including the Ute, Paiute, Goshute, Navajo, and Shoshone. In 1869, Promontory Point, UT was the site of completion for the first transcontinental railroad. Utah is also one of the four-corner states, including New Mexico, Colorado, and Arizona, which all connect at right angles. Utah boasts some of the country's best mountain biking trails, hiking, rock climbing, scenery, and skiing. It is also host to a cluster of National Parks, inlcuding Zion National Park, Arches National Park, which features over 2,000 natural rock arches, Bryce Canyon, and many other parks, forests, and recreation areas. 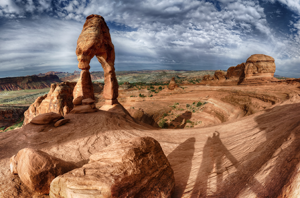 "Delicate Arch, near Grand, UT, August 30, 2014" by Max abd Dee Bernt is licensed under CC BY. 2009 Utah. New York: Children's Press, 2009. N.d. Utah: Its People, Resources, Attractions and Institutions. Lake City. 1998v Utah. Oakland: Compass American Guides.